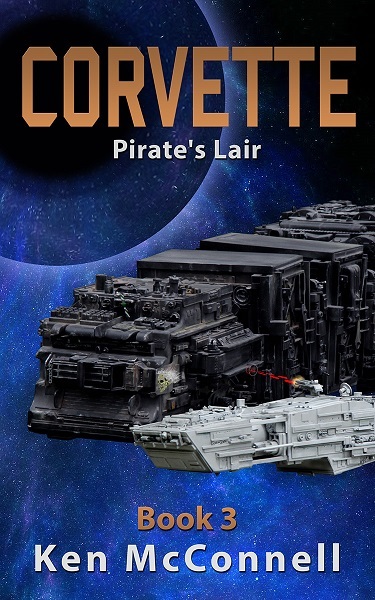 Corvette 3, Pirate’s Lair is heading out to Beta Readers and will then go to my Editor. I’m hoping to have it out in ebook format in May. I still have to make a cover for it. At this late date, I have no idea what that cover will look like. I think it will be orange titles and mostly blue nebula. Probably have some “laser beams” on it because, hell yeah, lasers! Meanwhile I’m well into my next Mystery novel written under my alter ego’s name, Johnny Batch. It’s called Kill Dash Nine and I hope to have it out before Christmas of this year. So if you’re one of the one percent my readers who have read Null Pointer and are still waiting for another Joshua Jones mystery, this is your year. So what’s on tap after I finish KD9? I had planned to dive into the fifth Star Saga novel – XiniX. But looking at my book sales numbers tells me I need to keep writing Corvette books like there’s no tomorrow. I’m selling far and away more copies of them than any of the Star Saga books. So XiniX is going to the back burner for a while. I’ll probably start writing the first of a trilogy called Destroyer using the same characters from Corvette trilogy. I’d like to plan out all three books and then start writing the first one in the fall of this year. So in 2018 you will get the third Corvette novella and a new Mystery novel. Next year you’ll probably get two new Destroyer books. I have three novella trilogies with the same cast from Corvette. The ninth novella in that series will end right before the events in Starforgers, Book 1 of the Star Saga. If I continue with at least two novellas per year, then in 2021 I’ll finally be working on XiniX. That’s all for now. I’ll try and do another post before the end of the year. Finally, you can order your own copy of the Corvette sequel in paperback. Once again I’ve chosen to go with Amazon’s quick and dirty pre-formatted paperbacks. Primarily because it’s less work on my part. Sure, I have to struggle and swear with LibreOffice Write to format it, but when it comes to creating it on Amazon it’s pretty painless. I think eventually we’ll produce some paperbacks of the Star Saga numbered books, but we’ll take the time to do the PDF’s of those in the same way a traditional publisher would, so we can control everything and make them look awesome. Right now though, the sad reality is that I can’t sell paperbacks in the same volume as I do ebooks. Not even close. So it doesn’t make any financial sense for me to spend the time and labor on creating them. It’s relatively easy for me to make a decent ebook and get that to market. Follow the money, right? You can click on this LINK to order your copy today. I’ve had lots of fun writing this trilogy and I hope they provide you with a few hours of pleasure in this crazy old world we live in. 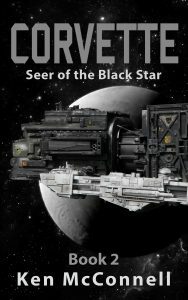 Eight months after my Corvette novella launched, I’m releasing the sequel – Seer of the Black Star. That’s the fastest turn around for a book I’ve ever managed and it happened for one reason only. Corvette got fans! 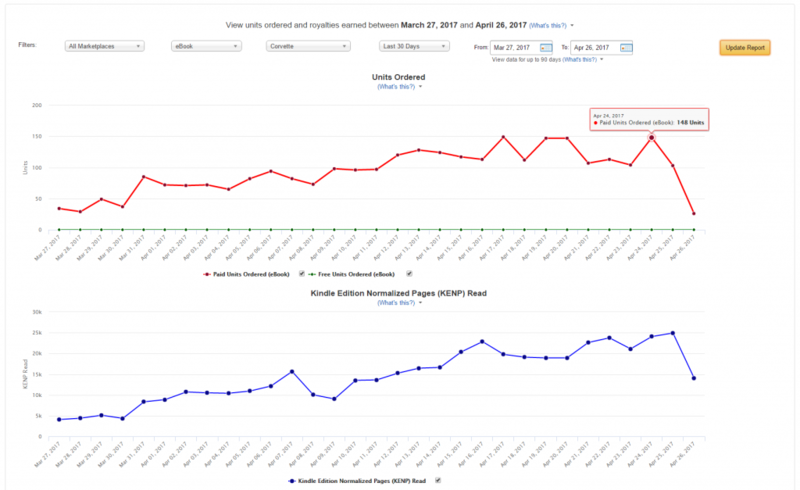 The little novella about the littlest ship in the Fleet took off and became a best seller in it’s first month. I’ve sold 7,268 copies so far this year and what’s better than that? It’s lit a fire on my back list and led to eleven thousand sales total on the year so far. Not too shabby. The best way to ensure I write a sequel is to buy my books, not just one, but all of them. Fans have done just that and this book is their reward. If you enjoyed Corvette and then went on to read a few of my other books, I thank you! This book’s for you! Seer is the second book of a planned trilogy and I’m writing the next book as I launch this one. With any luck, book 3 will be out next Spring and the trilogy will be complete. If sales continue to climb for this series, I can assure you there will be more. I have another trilogy planned with Vance and his crew that will be called Destroyer. In the meantime, I’m back to the Star Saga next year, writing Book 5, XiniX. What you see above, is the end of chapter two of the next Corvette novel. 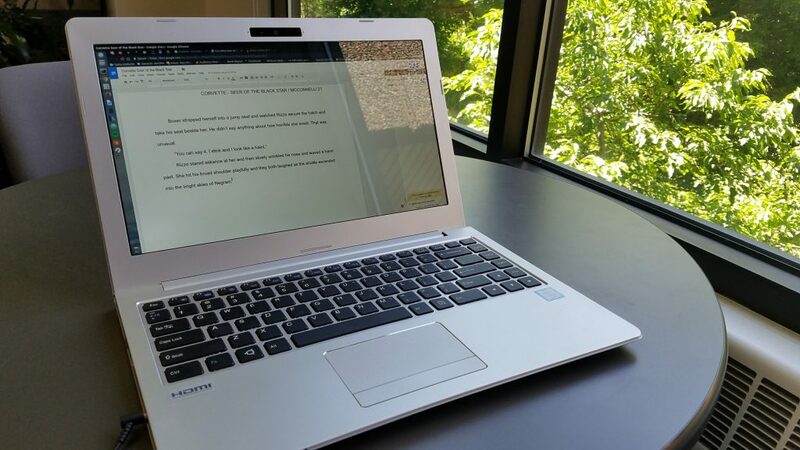 Being written on a shiny new System76 laptop purchased with money I earned from selling the first Corvette novella. You gotta love that. I’m writing two more Corvette books this year to satisfy the demands of readers. That’s a perfect storm for a writer. Having fans that buy your novels and want more, ASAP. 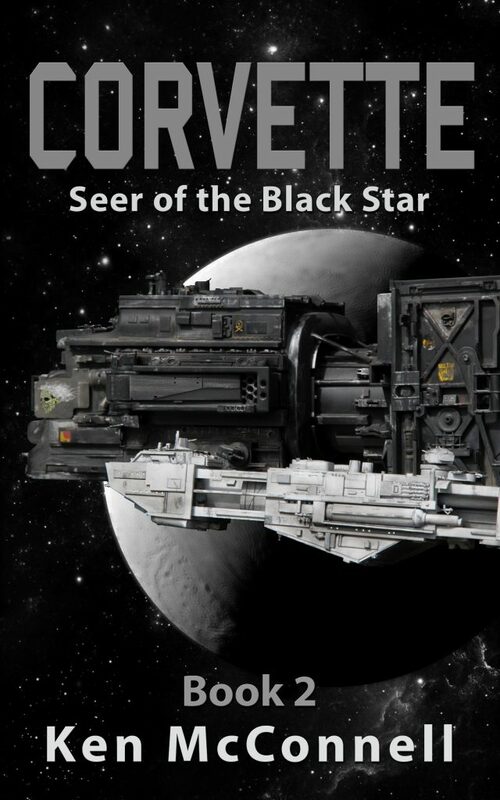 The first sequel is called, Corvette – Seer of the Black Star and will take place about a year after Corvette. Then I will write another one called, Corvette – Pirate’s Lair. 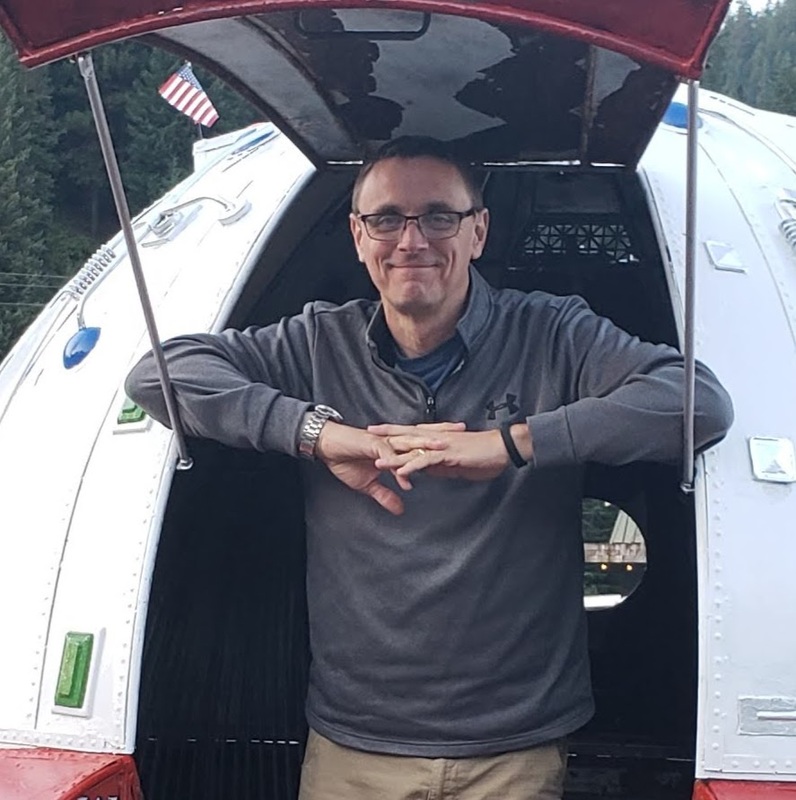 As you can guess by those titles, the crew of the Weippe are back to escorting transports and defending them from shipping pirates. We’re at the month mark after the release of my novel, Corvette. The book debuted on 21 March but didn’t really take off until April. What I’ll be looking at today are April’s numbers. This chart is from my KDP dashboard and shows the sales of just Corvette. Getting to 50 on the third day was key to kickstarting the whole climb. After that it was the jump to just under 100 that put me on some Best Seller lists and from then on the climb was pretty steady. Getting over the 100 a day peak resulted in a big boost in sales that lasted until the 150 a day period which is still off and on until the end of the month. The blue line graph is how many page reads the book is getting in the Kindle Select program. Much of the time I make more money off of those page reads than I do by actually selling a copy of the ebook. Amazon pays you for a “sale” after a reader completes 60% of your book. This is why it’s essential for your book to be in Kindle Select. 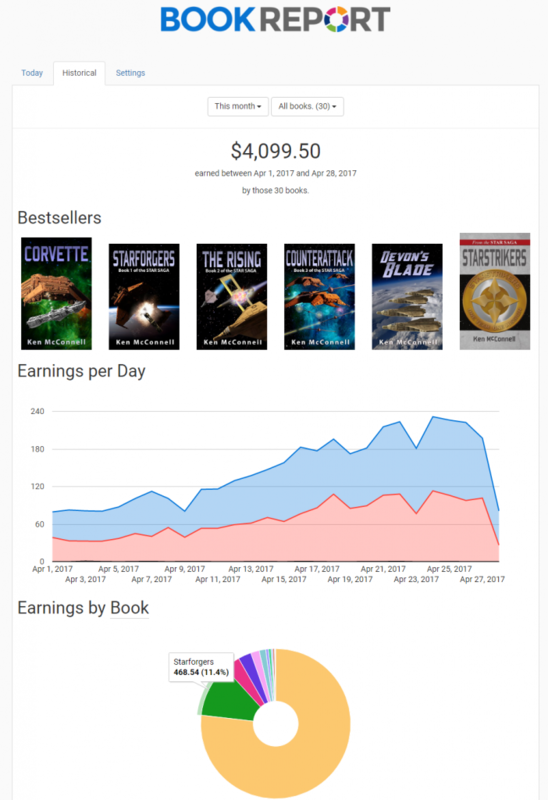 This chart shows how Corvette’s sales are boosting the sales of my other Star Saga books. About two weeks into the month I slid three more of my lower priced books into Kindle Select to boost readers. It’s only just starting to help towards the end of April. This means I had to take the books off sale at Kobo and Nook but that was not a problem since sales on those platforms were non-existent. I decided to pay for a better graphing tool for my Amazon numbers and here is a late April screenshot of sales using Book Report. 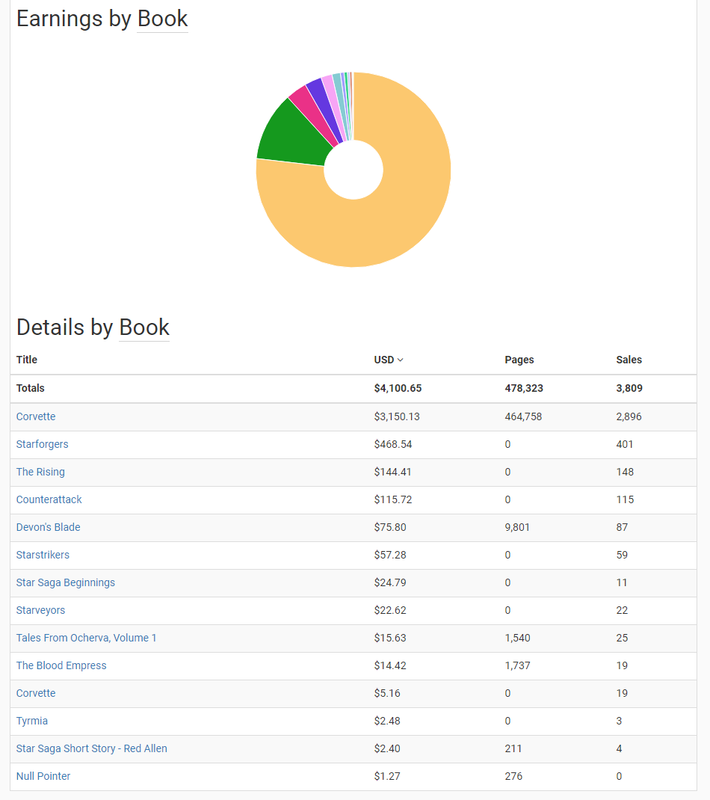 I like this tool because it has graphs and a pie chart and book covers with links to the books. Laying the Kindle Select reads on top of the sales numbers really shows you how they correlate. Select are in blue and sales royalties are in red. I told you being in Select pays! Also of note here is the widening slice of pie that is Book One of my Star Saga – Starforgers. The thing I want to see is if all those Corvette readers start making their way through the series. This should drive sales more and more as Corvette fades from the bestseller lists. Here is a breakdown of the earning per book for April. Keep in mind that Devon’s Blade, Ocherva and Blood Empress have only been in Select for a few weeks. Their numbers should grow next month. This is a fun graph from Amazon’s back end that shows my Author Ranking which is a Beta program that compares your sales to others in your genre. It changes hourly. I like it because it shows the rise from obscurity to hit in one month. The last time my sales took off like this I only had one book out and the whole thing folded in about two months. Now that I have close to a dozen books in the same universe, it will be interesting to see if I can gain a following. 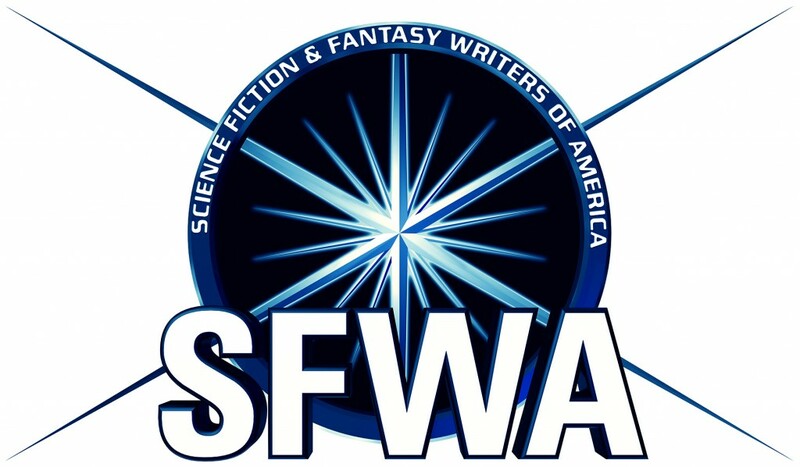 Once again, spending a decade writing as many novels might finally bear some fruit. Today’s the official release day for my latest novella, Corvette. You can get it exclusively on Amazon for the Kindle and in paperback. If you have pre-ordered your ebook, check your Kindle device or app to read it now! Corvette takes place before Starforgers, Book One of the Star Saga. It’s a great place to start if you are considering reading the Star Saga. Consider it Book Zero of the series. As always, please be kind and leave a review. Thanks! 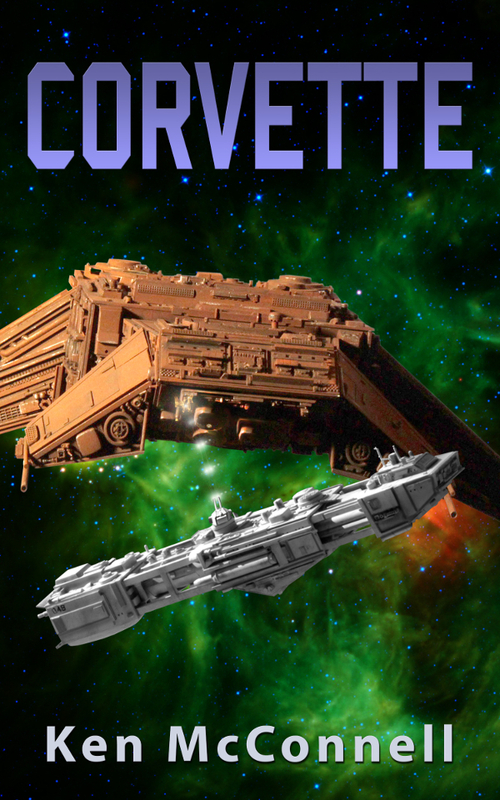 Corvette is the first novel that I have released in paperback and ebook at the same time. The novel is enrolled in the KDP Select program and will only be available on Amazon for the first 90 days. I have also used the KDP Paperback program to convert the ebook into a paperback. 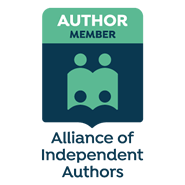 Amazon purchased the print on demand publisher – CreateSpace a few years back and now they are finally linking that software to their successful Kindle Direct Publishing program. The KDP Paperback program is still in Beta, but I thought I’d give it a try for this new release. I uploaded the ebook to the system and it converted it into a 5×8 inch paperback sized Word document. I then downloaded that document and tweaked it a bit to make it more like a proper paperback. By that I mean I brought some of the front matter – copyright page, for instance to the front of the book and added page numbers. Since I’m not used to using Word templates, I had to mess around until I figured out how the page numbering worked. For the cover I used on of Amazon’s canned templates to make things easier for myself. I think in the end the book looks quite nice and should please most readers. However, it is not as good as you can do if you hire a professional graphics artist to do the cover and the interior yourself. Previously that was my approach to making some of my other novels in paperback through CreateSpace. You can still upload your own professionally produced PDFs of the interior and exterior if you have them, but I wanted to see how good of a product I could make by myself with very little effort. I guess readers will have to let me know in the reviews whether they like the format or not. To me, the book looks clean and neat, but very self published. I have decided that I can do without a perfectly produced paperback until I gain a much bigger following and could afford to pay to have nicer versions made. While I was doing the Corvette paperback I was also doing the Devon’s Blade paperback using KDP Paperback. Both books are now available through Amazon. A photo album of the proof copies and some comparisons is available here, for those of you considering whether or not to roll your own paperbacks using this system.